Seasonal Silhouettes winner, and more! The reader who won Edyta Sitar’s Seasonal Silhouettes is No. 56, Maureen! Congratulations Maureen! I know you will enjoy these beautiful designs. 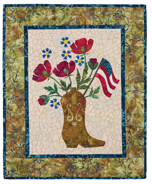 In other news, my buddy Kim of Chatterbox Quilts has been cooking up some HEAT: “Hand Embroidery Appliqué Technique.” It’s so charming, and be sure to check out the introductory pattern that’s free for a short time on Kim’s blog Chatterbox Quilts Chitchat. 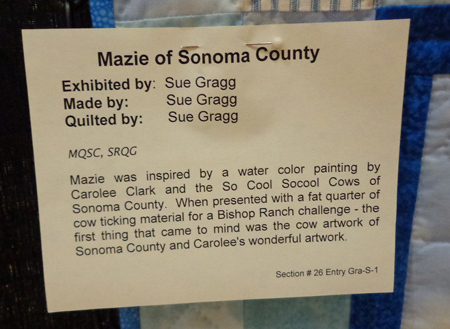 Sue cites artist Carolee Clark as her inspiration, along with some fancifully decorated cows that are famous in Sonoma County. 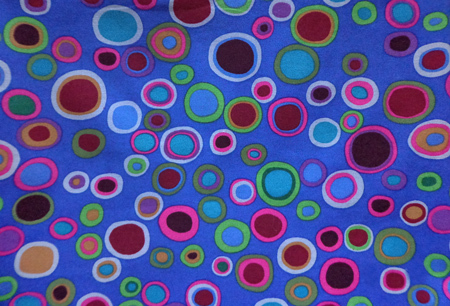 To me, Mazie looked like Kaffe Fassett fabric. 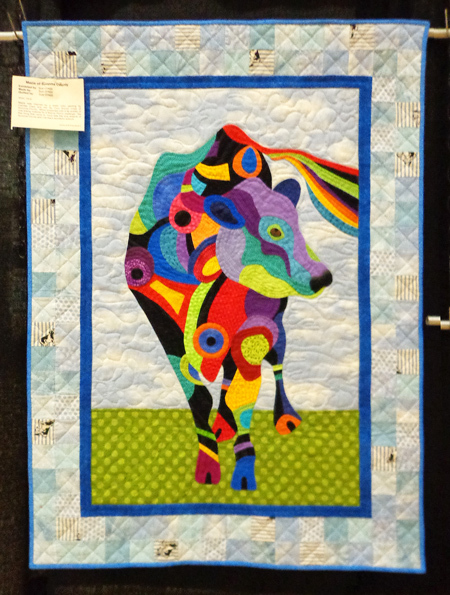 Last time I went to Quilt Market I made the pleasant acquaintance of one of the staff members at Landauer Publishing. Recently she emailed me to ask if I would like to share one of their brand-new books with readers of the blog. Would I? Of course! 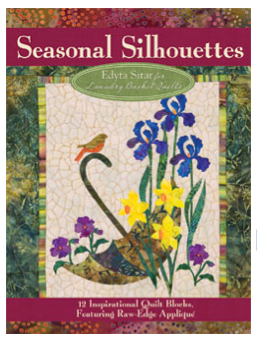 I’m so excited to say that it’s Edyta Sitar’s Seasonal Silhouettes, hot off the presses! Edyta used batik fabrics for their natural hues “touched by nature’s paintbrush” and tight weave. 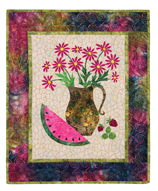 Since she does a form of raw-edge appliqué in which she stitches 1/8″ from the raw edge during the quilting process, batiks are an excellent choice. There’s a two-page spread of “color chips” so you can take the book to the fabric store with you in case you need to round out your stash of batiks. What I really like is that the author gives an informational roundup of three different kinds of paper-backed fusible web, with the pros and cons of each, to help you make your choice for these projects. 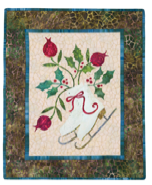 There’s also complete information on how she does her raw-edge appliqué and her quilting. The gorgeous book is slightly oversized at 9×12. I imagine that’s so it can include… yes… full-size pull-out template pages for your convenience! On top of that, you can actually order all of the pre-made laser-cut appliqué shapes, complete with fusible web on the back, from Edyta’s website Laundry Basket Quilts. Those are just three of the 12 designs… there’s one for every month, and you can stitch up as many or as few as you like. There’s a short video about the book at the Landauer website. Just click on the “Look Inside” tab. Thanks again to Landauer for providing a copy to give away to a lucky reader. If you’d like to enter the drawing, please leave a comment on this post before 7:00 p.m. California time on Friday, June 7. Drawing open to U.S. and Canada mailing addresses only. Do not reply to an email feed… instead come on down to the blog itself on the internet and leave your comment there.